Or maybe you’re looking for a Catholic Preschool Curriculum for teaching at a Co-op or in a religious education setting? Either way, your search is over! Books ship within 5 business days when the money is received. Please double check your shipping address before finalizing your order. 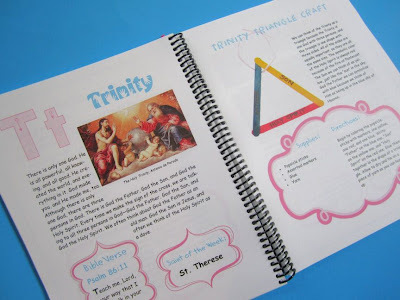 Some of the material and crafts in this book have been shared on catholicicing.com in the last year and a half. That is all still available for FREE! (Click here to find the new and improved navigation page). I am so excited to finally be able to offer this complete program to you, which now includes over 50% new, never-before-published content, in one easy to use book! 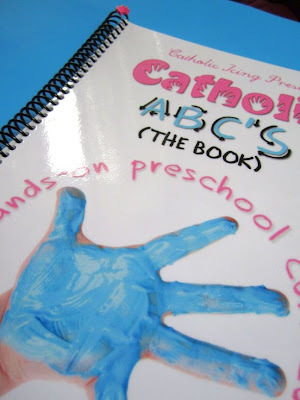 This curriculum was developed working with children at a Catholic preschool co-op, and it has proved to be successful in a real-life classroom! 26 lessons, one for each letter of the alphabet, with corresponding craft, bible verse, full-color visual aid, and a saint of the week! Activities that are perfect for preschoolers ages 2-4. 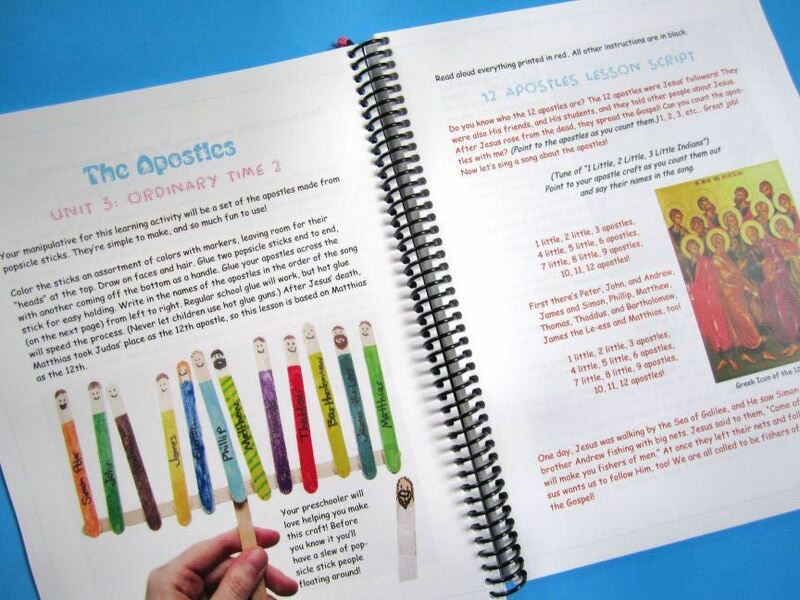 5 hands-on unit studies that follow the liturgical year and teach Bible stories with songs and manipulatives! Exposure to letters, letter sounds, numbers, and counting. Material to engage visual learners, auditory learners, and kinesthetic learners. Easy to complete crafts with each lesson! Only readily available (and affordable) craft supplies needed! Lessons to help teach your preschooler (and you!) about the Catholic faith. 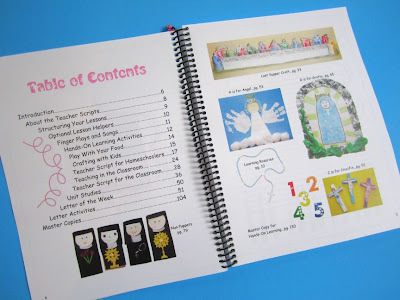 Many ideas to help teach your preschooler to know, love, and to serve the Lord! The entire book is in full color and includes pictures of all the completed crafts and projects. There are also beautiful pictures of Catholic art sprinkled throughout the book. I wrote this preschool curriculum to be easy-to-use, and involve only a minimal amount of prep time. Catholic ABC’s started on my blog (here) at Catholic Icing, and has matured into this user-friendly book! 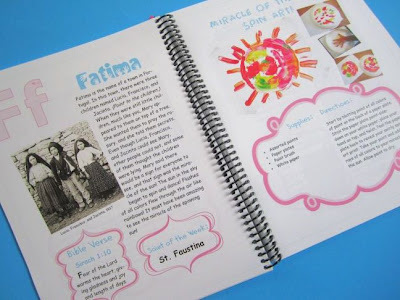 The year is broken into five unit studies that follow the Liturgical year. These unit studies introduce the student to counting and numbers. Each week you start with the easy-to-use teacher script, then plug in the current unit study and the new letter for the week. 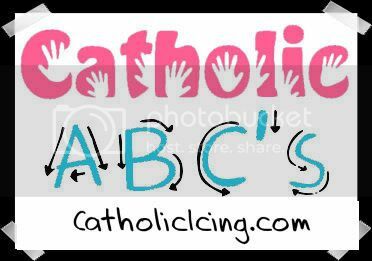 Catholic ABC’s makes it that easy! 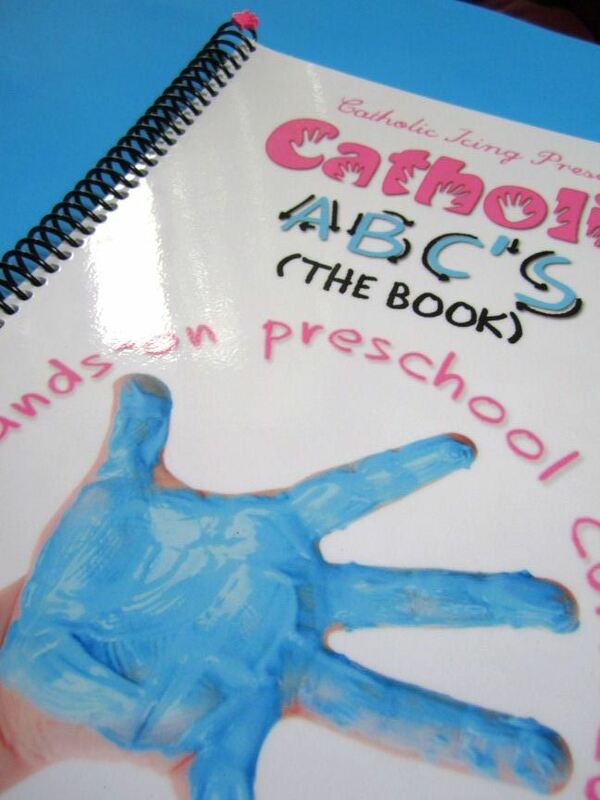 This Catholic preschool curriculum is hands-on all the way! From the unit studies to learning the alphabet, to crafting, singing, and counting- this book strives to make learning (and teaching) fun! Hey, why shouldn’t it be fun? This book was designed to engage visual, auditory, and kinesthetic learners. 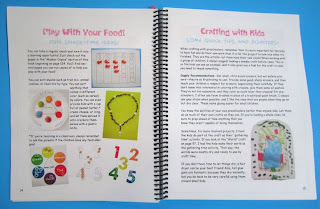 The activities in this book help develop gross and fine motor skills. I believe that children learn best when they have multiple senses engaged, and when they have meaningful experiences that they can connect with. This book will help you create these kinds of experiences with your preschoolers! I’ve been searching long and hard for a hands-on Catholic program that is boy-friendly. Thank you! Received your book in the mail this week. Amazing and awesome work! I love the guidance of the teacher script and the organization of it. It is the type of resource I have been looking for all over as I begin working with my preschooler and toddler. I just wanted you to know that I brought your book to my beginning of the year CCD meeting and I expect you’ll be getting a few orders for Miami today; everyone fell in love with the book! I received your book and LOVE IT!!! I showed it to our Catholic co-op and everyone was so excited to see it!!! I just got my book in the mail and I am PUMPED! My kids are already fighting me for it! 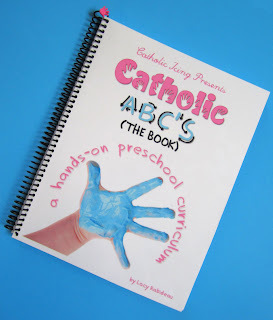 I am going to be the Pre-K instructor at the new Aquinas Learning Center in my area and I just wanted to let you know that I will be using your Catholic ABC’s Curriculum for my class, we all love it and think that it is just awesome! Thank you so much for doing what you do, because of this Curriculum my kids are going to have a great Homeschooling year! Got your book last week and we have already planned out our Pre-school for the remainder of the year. So excited to get started and the book is just amazing!! What a great help!! All the mom’s from the pre-school plan on buying one. I hope you have some left!! Just wanted to say I got your book in the mail yesterday and I LOVE it…even with the website the book is worth the money b/c it is so organized. I am a retired Catholic school teacher; it takes a lot to impress me 🙂 but I am IMPRESSED! 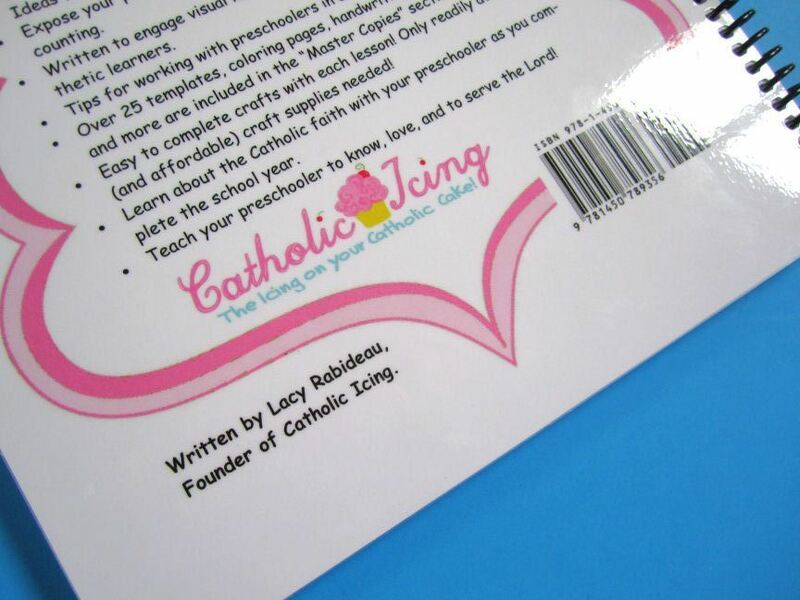 PARENTS: Lacy’s new book, Catholic ABC’s, is not just for homeschooling preschoolers, it goes far beyond that. If you want to bring a more Catholic presence into your home, you should take a look at this book. Children in the primary grades, even those in Catholic schools, would greatly benefit from living out their faith in all the grace-filled ways that Lacy has included in her book. Parents can easily adapt the structure to their own family’s needs. The blog is a perfect compliment to the book, especially if you are doing it with older children. I wish I’d had this book and this blog 30 years ago for my family and the children I taught. I pray that it reaches a wide audience. Got my book today and I am so impressed! I can’t wait to start this with her!! My copy arrived today and looks wonderful! My children already stole it to make Popsicle stick people. Just finished our first year of preschool co-op using your curriculum. It has been awesome! We have loved every step of the way and I feel like the kids have grown for much in just one year. I am using the heck out of your ABC curriculum for our parish summer school, the first time we’ve done the preschool age group. Two days down, two to go! Yes, we are cramming a whole lotta stuff in four days but so far so good. Thanks so much!! I have to tell you how excited my 3 year old was when I brought home your ABC’s book. She has shown the grandparents via Skype too many times to count! That is her school book and she can’t wait to start!!!!! I just quickly wanted to be able to tell you how very much your website has changed my life. I am new to homeschooling this year with four little ones to teach and a baby/toddler to keep track of. I love your creative ideas and appreciate how thorough you are in explaining things in your book. You give me inspiration and I talk about you all the time to my friends! Thank you from the bottom of my heart for being such a blessing to me and all Catholic moms. This book is so well done, and so obviously full of Lacy’s zeal for hands-on education, that I couldn’t help but think, “Hmmm…maybe I should teach preschool at our co-op again sometime.” Since that can be a pretty exhausting task, that is saying a lot for this book! -Angie, Founder of Catholic Mothers Online. Read her full book review here.